Learn the Total Hip replacement(2 stage revision): Combined intra-pelvic and extended trochanteric osteotomy approach surgical technique with step by step instructions on OrthOracle. Our e-learning platform contains high resolution images and a certified CME of the Total Hip replacement(2 stage revision): Combined intra-pelvic and extended trochanteric osteotomy approach surgical procedure. The old adage, ‘You don’t want to start from here,’ rings true for many revision cases, especially when you work in a tertiary referral centre. 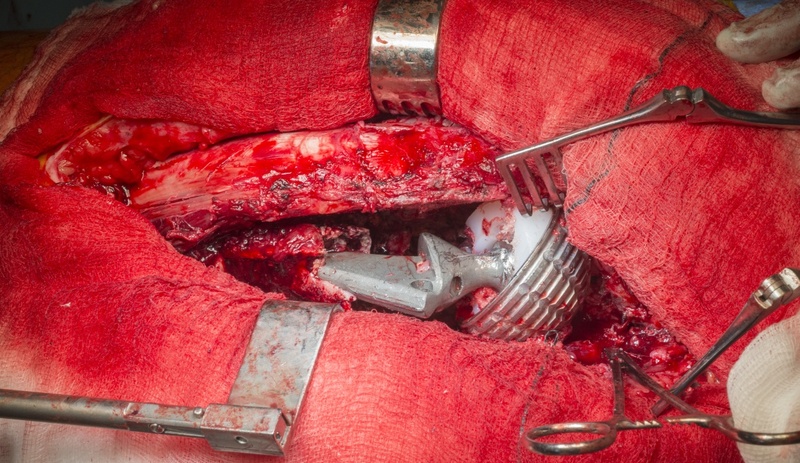 This case details the thought processes and techniques around the first stage revision of an infected and ‘intra-pelvic’ hip , an extreme revision scenario. In this case the patient had earlier received a primary hip replacement which was revised for ‘aseptic loosening’. This revision entailed bony reconstruction with a metal augment. Unfortunately this revision became infected. The patient did not want further surgery and was coping well on suppressive antibiotics, until they were ceased. In addition to the usual work-up, patients with an intra-pelvic hip require imaging to specifically identify the location of the important non-orthopaedic structures , in this case the large vessels and the ureters. Vascular and general surgical assistance is required. The principles of a thorough and controlled debridement is covered in this case as well as an Extended Trochanteric Osteotomy. The second stage hip replacement (with a custom 3D printed implant) will be covered in a subsequent technique (once infection eradication has been confirmed). Prosthetic joint infection is miserable condition and there is evidence that it is an increasing problem. The cost to society of revising an infected revision more than double that of a non-infected revision. (Total hip arthroplasty revision due to infection; A cost analysis approach. Kouche et al Orthopaedics and Traumatology Surgery & Research 2010). The cost to the patient is often overlooked but it is not unsurprising that patients with infected joints have poor mental health outcomes. Imagine having a chronically painful joint replacement, the prospect of at least one more significant operation, an 8% chance of revision failure and at best having poorer function than primary surgery.